James Franco has turned into a prolific director, with 14 credits since 2010. However, he saves his mainstream efforts for Actor James. Director James is more interested in the arthouse, and none of his works so far have seen a wide release. 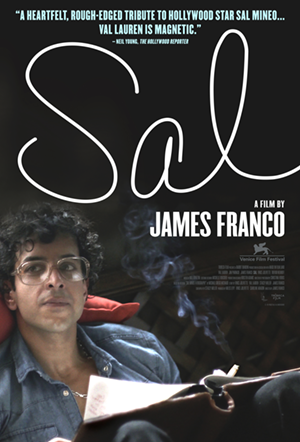 Sal should have some broad appeal as a biopic of notable star Sal Mineo, yet two years have passed since Sal premiered at the 2011 Venice Film Festival. Tribeca Films is nearly ready to release it to the world on VOD October 22, followed by a limited theatrical release November 1. Val Lauren stars in the title role. Franco, James Franco, Vince Jolivette, Jim Patrick, Trevor Neuhoff, Stacey Miller, Raymond T. Williams co-star. Watch the trailer after the break. SLEEPY HOLLOW Recap: "For The Triumph Of Evil"